The “eat local” movement is thriving across Northeast Florida. From local farms and food producers to farmers’ markets and farm-to-table restaurants, Jacksonville offers a vibrant locavore culture to consumers concerned about the origins, nutrition and sustainability of their food. Jacksonville boasts a rich history of electing African-American women to political office. In fact, the first women elected to the Jacksonville City Council after Consolidation in 1967 were African American. Breaking the glass ceiling in the world of politics is a legacy women of color proudly leave to our community; it is a bold testament to their resilience and resolve to protect the rights of all. Recent advances in vaccine research have laid the groundwork for addressing many of the key public health issues of the 21st century. Yet vaccines have also proved a source of popular misunderstanding, and ever-new outbreaks of infectious disease challenge researchers and practitioners alike to keep pace with a globally interconnected health environment. Today’s instant-knowledge generation is already using emerging technologies, and tomorrow’s digital leaders are already mastering new apps and new knowledge to boldly go where no one has dared to go before. TEDxFSCJ is a unique, single-day conference inspired by TED and produced by a diverse group of students, faculty, and staff For our third annual event, TEDxFSCJ aims to ENGAGE. 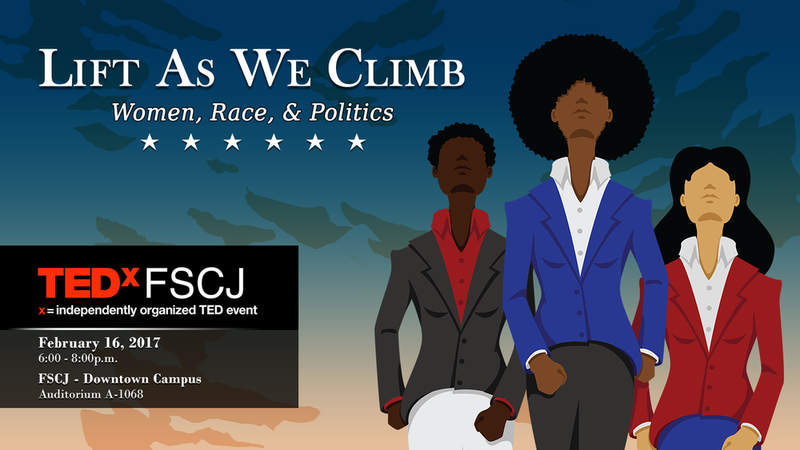 Our theme is both a statement of our intent to engage with ideas, social issues, and various Jacksonville communities and a challenge to our audience to take the next step after the event to truly engage with what they’ve heard. TEDxFSCJ is partnering with OneVoice and the Museum of Contemporary Art Jacksonville (MOCA Jacksonville) to host a salon that addresses how art in its many modes—painting, poetry, spoken word, and historic neighborhoods—contribute to the flourishing of communities. The evening will include music by Mal Jones, creator of the Lyricist LIVE, an open mic street party held the first Wednesday of every month during the downtown Art Walk, as well as TED talks, audience discussion, and four expert panelists who have made lasting contributions to Jacksonville’s artistic community.